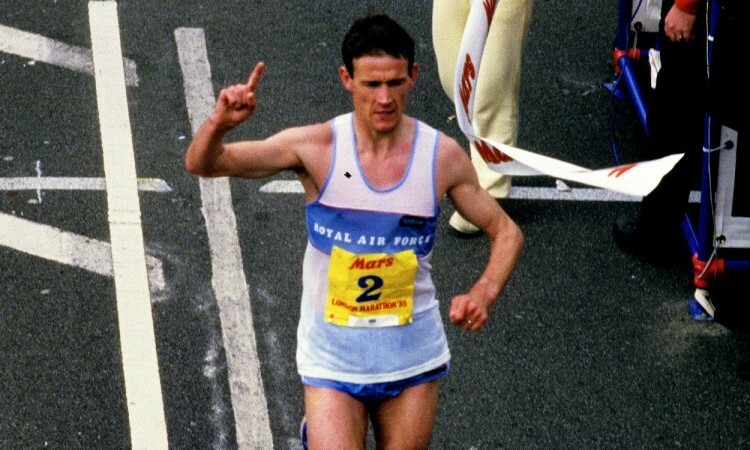 Steve Jones on his way to London Marathon victory in 1985. Wales’ current crop of marathon runners may not be fuelled on a diet of coke and meat pies that took Steve Jones to the world record. But as he tells Dai Sport’s athletics writer Owen Morgan in an exclusive interview, the now Colorado-based running legend is excited about the chances of the likes of Dewi Griffiths, Josh Griffiths and Natasha Cockram in London this year and is always ready to pass on his knowledge to the next generation. A familiar face on the other side of the Atlantic will be keeping a close eye on events at this year’s Virgin Money London Marathon. With a number of elite Welsh athletes toeing the line in the capital on April 28, the exiled compatriot, who knows a thing or two about marathon running, will follow their performances closely. Ebbw Vale’s Steve Jones not only won the London Marathon in 1985, he did so having sensationally set a new world record the first time he completed the distance at the Chicago Marathon the previous year. Despite having lived in Boulder Colorado for almost 30 years, the former RAF technician still takes an active interest in Welsh endurance running. In fact, the running club Jones set up in Boulder hosted Dewi Griffiths – currently Wales’s fastest man over 26.1 miles – for a spell of altitude training, earlier this year. Talking exclusively to Dai Sport from his home in the foothills of the Rocky Mountains, Jones spoke with genuine passion not just about Griffiths, but Welsh endurance running in general. The former Newport Harrier believes Griffiths is building nicely towards London. Dewi Griffiths won his seventh Welsh XC title days after returning from a training spell in Colorado with Steve Jones. “Dewi came and stayed with us and ran with my group for a month,” said Jones. “It was just general altitude training. He has most of the tools; I don’t think he needs to work on any specifics. Asked whether he felt Griffiths was back to the kind of form he was showing before a long-term hip injury robbed him of a chance to compete at last year’s Commonwealth Games marathon, Jones said he felt the Swansea Harrier was in even better shape than when he ran 2:09.49 on his marathon debut in Frankfurt two years ago. “I think he’s probably ahead of where he was when he ran 2:09, that’s for sure,” said the 63-year-old. Jones says there is some good natured competition between the two men, with the young pretender aiming to match or even exceed some of his mentor’s prodigious achievements. The 1986 Commonwealth Games 10,000m bronze medallist still holds the record of nine Welsh Cross Country Championships – a target Griffiths is keen to chase down, having won six in a row before his hip injury denied him a shot at a seventh last year. With this year’s championship falling just a couple of days after Griffiths was due to fly back from Colorado, the 27-year-old was concerned the effects of a long flight might deny him the chance to close the gap on Jones’s record. Welsh running legend Steve Jones at the Welsh Athletics Championships 100th anniversary celebrations. Jones said: “I don’t know what the cross country scene in Wales is like now, but he was concerned that the competition was going to be really tough and he was going to be tired from travelling back from America a few days before. Jones said: “I think he’s got seven titles now. He’s catching up there. We always have a little bit of banter about what I’ve done previously and what he’s trying to achieve. I know it’s not anything personal; he just wants to be the best he can be. It was Jones who blazed the trail for Welsh marathon running when he shocked the athletics world at the Chicago Marathon in 1984. Lining up alongside the likes of Australian World Champion Rob de Castella and Portugal’s Olympic champion Carlos Lopes, Jones not only won but shattered de Castella’s world record by clocking 2:08.05. On his return to the Windy City 12 months later, he ran even faster, lowering his PB to 2:07.13 and just missed out on breaking Lopes’ new world record by one second. Earlier that year, Jones had also won the London Marathon in 2:08.16, despite stopping for a toilet break. Three years later he destroyed a high class field in the New York marathon to win by a huge margin of 3 minutes 20 seconds in a time of 2:08.20. Steve Jones with Josh Griffiths (red t-shirt) and Dewi Griffiths (far right), along with Welsh double Olympic marathon runner Steve Brace (far left) and fellow marathon runner Angharad Mair. Jones’ British record of 2:07.13 stood for an incredible 33 years until it was broken by Sir Mo Farah at the London Marathon last April. Could Griffiths one day lower Jones’s best time, which still stands as the Welsh record? The Newport Harrier said: “If you would have asked me that two years ago I probably would have said no. Did the former London winner have any particular advice for Griffiths on his London debut later this month? “No, not really,” he replied. “I’ve always encouraged him and praised his strength I suppose, but it’s a marathon and so much can happen regardless of where you think your potential is and whatever anyone else thinks your potential is. “The marathon is a bit of a beast and sometimes you beat it and sometimes you don’t. In his pomp, Jones was compared to the character Alf Tupper in the popular comic strip “Tough of the Track”. Tupper would combine long hours working as a welder with a spectacular running career where he would thrash the elite of British athletics on a diet of half-eaten fish and chip suppers and little sleep. Jones, who combined his running with a career as an RAF technician was seen in a similar vein. And he feels there are also parallels with Llanfynydd sheep farmer, Griffiths. “There are definitely similarities,” said Jones. “He is a bit of a Tough of the Track character, with the sheep farming. He’s in lambing season right now so it’s all go for him. “When he’s at home on the farm he’s not sat on his backside all day wondering ‘what time I should go for my next run’ or whatever. Back in the 1980s, some of those ingredients were a little different to today, especially in the area of diet and nutrition. Legend has it that Jones’s world record was fuelled by a diet of Mars Bars, Coca Cola and meat pies. “Yes, that’s true,” said Jones. “Back in my time, we were all working stiffs; we had to grab our food when we could, whether it was at lunchtime in work or whether you ran instead of eating your lunch. “A large part of my daytime diet would have been a Mars Bar or a Coke, or a meat pie from Peters Pies or something. “So, that is true. I stress that to everybody. The science in the sport has changed dramatically since my day, not all of it for the good, but for the most part, yes, nutrition plays a huge part in recovery and what these young people are doing today. “The front runners today are doing the nutrition science, the heart rate monitoring, physiological testing and all that sort of stuff. It plays a big part and science will play an even bigger part in the future. “But I came from Hilltop, Ebbw Vale. We ate meat and potatoes, or just chips, or a sugar sandwich, or bread and dripping, you know? Andy Davies, finishes the World Athletics Championship marathon in London, is another of Wales’ top quality marathon runners. Could Jones have run faster in his heyday had he enjoyed the scientific and nutritional support available today? “You know, I get that question a lot, how fast I think I could have gone when I was actually running back then. Despite the developments in technology, science and nutrition, Jones believes his basic running philosophy is just as relevant today as it was at his prime. Asked to describe that philosophy in a sentence, Jones said: “Put your shoes on, put one foot in front of the other and run as fast as you can. Referring to a recent experiment where athletes were stripped of all technology to run on a blacked out track, Jones said: “I would like to see that in action because it is close to my own philosophy. It’s a philosophy which is still working for Jones and the training group he coaches in Boulder. “I don’t run very much myself,” he says. “Sometimes I’ll get on a bit of streak of a hundred days and then I’ll wake up one morning and say I don’t think I’ll run today and I won’t run for another six weeks. “My enjoyment now comes from coaching, teaching my philosophy and watching people improve. Natasha Cockram won the Newport Marathon last year and will be looking to impress in London. He may be based 4,500 miles away in America, Jones is still a man of Gwent at heart and is delighted to see so many Welsh endurance athletes currently excelling alongside Griffiths. The London Marathon will also see namesake and fellow Swansea Harrier Josh Griffiths return to the course where he finished as the top Briton in 2017 and later that year saw him represent Great Britain at the London World Athletics Championships alongside Andy Davies, who also returns this year. They will be joined by Mickey Morris Racing Team athlete Natasha Cockram who exploded onto the scene by winning last year’s Newport Marathon. Swansea Harrier Kris Jones was due to be part of the elite field, but has since withdrawn from the race. Jones says these are exciting times for Welsh endurance running. “You just have to look at some of the success these young lads and young ladies are having right now. “Josh ran really well at the Big Half in London a couple of weeks ago, Dewi is obviously on top form right now, Andy Davies has been a bit quiet since the Commonwealth Games, I think, but it’s all on the up and up. Jones competed at the Los Angeles Olympics and both the Helsinki and Stuttgart World Championships in the 1980s and 90s. He sees no reason why some of those competing in London can’t follow in his footsteps by qualifying for this year’s World Championships in Doha and next year’s Tokyo Olympics. “I would think so yes,” said Jones. “Dewi has got to be at the front of the line right now, but you’ve only got to look at what Josh did two years ago in London, he could find himself being in exactly the same kind of place this time around. Having representing Wales and Great Britain from 10,000m upwards for a decade, Jones is happy to carry on offering his vast knowledge and experience to any athletes back home. “I think it’s important for me personally and I think it could be important to any up and coming runners in Wales. “I have an interest, it’s where I started and while I don’t think people understand how much I would like to contribute, I do have a contribution to make.